Posted March 6th, 2016 by tstreet_admin & filed under News. Shortly after buying a downtown staple, a Denver restaurant group is headed to Belmar with a new concept. Roadhouse Hospitality Group plans to open Teller Street Kitchen, its 18th Colorado restaurant, this fall in the Lakewood development. Teller Street Kitchen is filling in the former Lane Bryant store at 445 S. Teller St., and Roadhouse COO Dan Shipp said he liked the location for Belmar’s recent growth spurt. Teller Street Kitchen has a 10-year lease with a pair of five-year extension options for its 5,200-square-foot space. Shipp estimated it would cost about $2 million to get the restaurant up and running. He said he hopes to open the eatery near the end of this fall. Belmar management approached Roadhouse Hospitality Group about bringing a restaurant to the Teller Street space more than a year ago. Shipp said the firm looked at other locations in the mall and considered building a new freestanding building near Alameda. The deal fell into place, Shipp said, after Lane Bryant decided to leave the property. The clothing store opened a new shop a block over at 340 S. Teller St. in March. Teller Street Kitchen’s menu will include a range of seafood, meat and pasta dishes. Entrees will run from about $12 to $28. Belmar will have 19 total restaurants and coffee shops by the time Teller Street Kitchen opens, but Shipp is aiming for a slightly upscale niche he said is currently missing. Construction on Teller Street Kitchen will begin in July, Shipp said. Boss Architecture is designing the space, and Jordy Construction is the general contractor. Teller Street Kitchen is the first concept of its kind for Roadhouse. 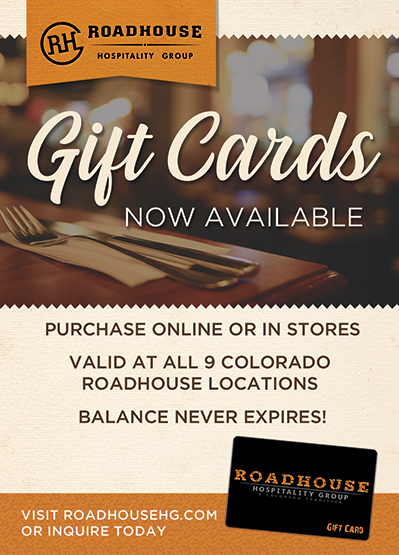 The Denver company’s brands include The Dusty Boot Steakhouse & Saloon, Hodsons Bar & Grill, Spanky’s Urban Roadhouse and a handful of other restaurants. Roadhouse Hospitality also bought downtown’s Wazee Supper Club earlier this year. Roadhouse is pulling into Belmar amid a building boom for the mixed-use Lakewood development. Christina Brickley, Belmar’s marketing director, said the development expects 400 residents will move into new townhomes, apartments and senior housing units by December. A new Hyatt House hotel is also under construction and is scheduled to open early next year.